More than a year has passed since Elizabeth Jean breezed into the Severn River near Annapolis, Maryland. There, we ended our four-year peregrination. 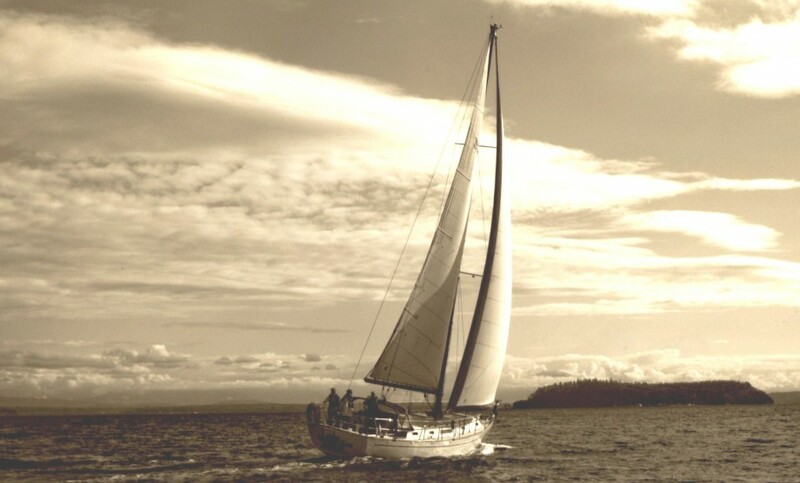 We’ve transitioned with surprisingly relative ease to land but find ways to maintain our “sea legs.” Eulalie is a charter captain and U.S. sailing instructor working throughout the Salish Sea. 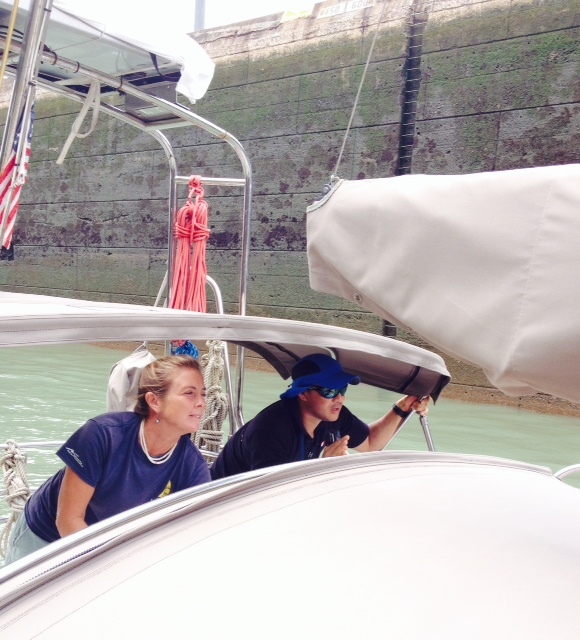 Her students benefit from all the lessons she gleaned from Elizabeth Jean over 4 years and 15,000 nautical miles. This spring, Eric co-taught a masters level course in ocean resource decision making and action taking and published an article on the proposed expansion of offshore oil and gas development. Meanwhile, this blog has patiently waited for us to be ready to write its final chapter. The blog begins with its mast head—”Joyfully exploring, surrendering to this moment, sharing the adventure.” One of our readers once insightfully observed, “It’s a covenant of sorts, isn’t it?” Exactly so. At the outset, these were the commitments we made to ourselves on how we wanted to live this dream. Now is the right time to take stock of our promises. Was our exploration joyful? Not always. Facing physical, mental and interpersonal challenges, at times we strove to make sure we weren’t merely moving or worse, “anxiously exploring.” Thankfully, joy was a persistent if not constant fellow traveler, with such encounters too plentiful to tally. Surrendering to this moment? Even the concept of surrendering, with its connotation of defeat, can be hard to wholeheartedly embrace. But, embrace it we did and found that with proper preparation letting go is the ultimate high. A case in point, riding a cresting wave over the El Salvador bar to enter safe harbor. Sharing the adventure? In the end, this was the easy promise. And for this ease, we have you to thanks. Some of you joined us on board to help with passages; others met us in distant ports of call; others opened your homes to provide showers, beds and other comforts. Many of you virtually joined us on these pages, letting us know you were with us in spirit. Our gratitude is yours. Grateful too are we, Elizabeth Jean’s fortunate crew, to one another for sharing this once-in-a-lifetime experience through which we have shared and learned so much. A while back, we mentioned you would know our blog was fully and finally finished when we sang a final chorus of our friend Willie O’Ferron’s Tale of the Elizabeth Jean. Please sing along. Off we go sailing on the Elizabeth Jean. We run with the tide and we’re chasing the breeze. We count all our blessings (whatever that means). And thank the almighty we’re livin’ the dream. Dorothy wished to fly over the rainbow, but in the end concluded that there was no place like home. 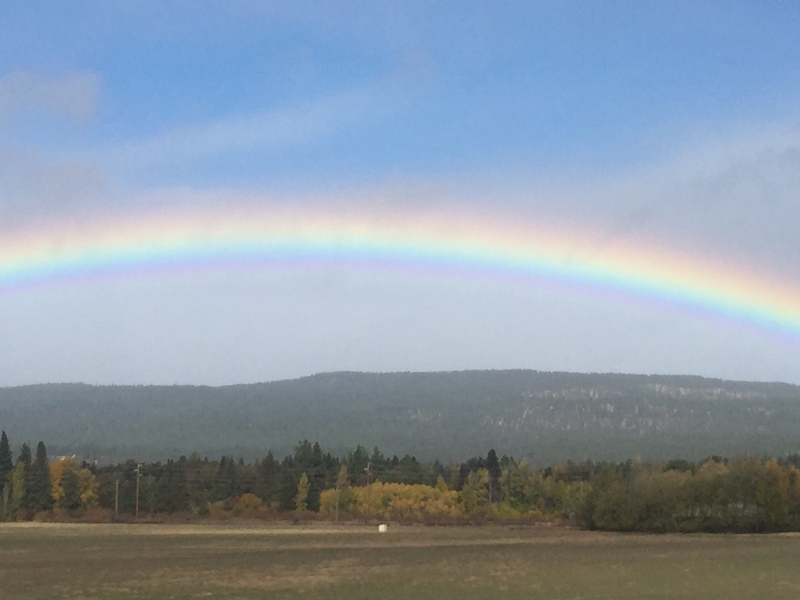 Thus, it was somehow fitting that a rainbow arched over the Kittitas Valley wind mills as we descended into Ellensberg, a scant hour and a half from that most emerald of cities, Seattle. Rainbows on land, as porpoises at sea, harbinger good luck for Elizabeth Jean’s crew. The rainbow grew brighter as we turned west towards the Cascade Mountains. As we crested the mountains, rain beat down on our ruby red Rav as she conveyed us home. Flame hued bushes lit the evergreen slopes. Soon we were at sea level, having completed the third of our three cross country road- trips in two months. 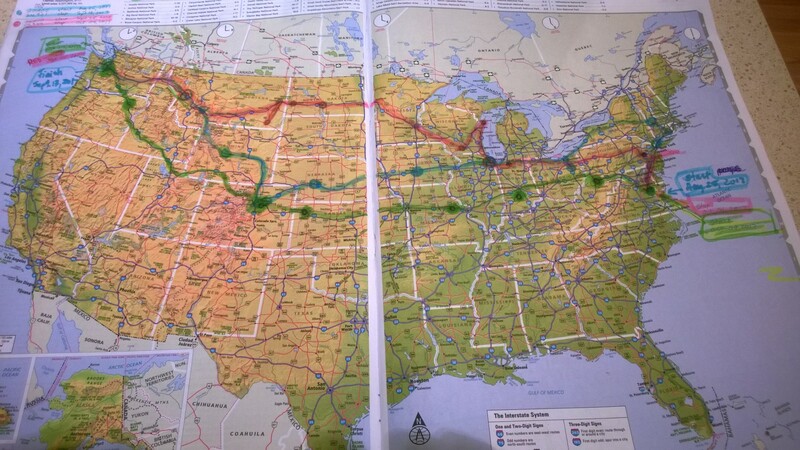 The red highlighted route shows our path in September from the east coast to Seattle. The blue route shows our return east at the end of September and early October with boat gear. The green route shows our final path in mid-October. Thanks to all our friends and family who made time for us in their busy lives along the way. 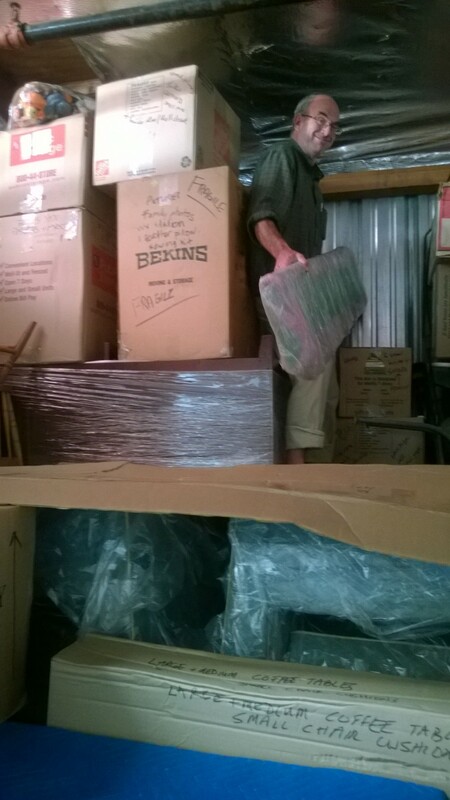 Eric is smiling because he was able to retrieve Elizabeth Jean’s carefully wrapped and stored doors without unpacking the entire storage unit. If it looks as if he is about as far back in the unit as he could be that is because we intentionally stored the doors deep in the storage unit because we would not be using during our voyage. It seemed to be a good idea at the time. We didn’t find munchkins, but we did find trolls in Mt. Horeb, self-proclaimed troll capital of the world. 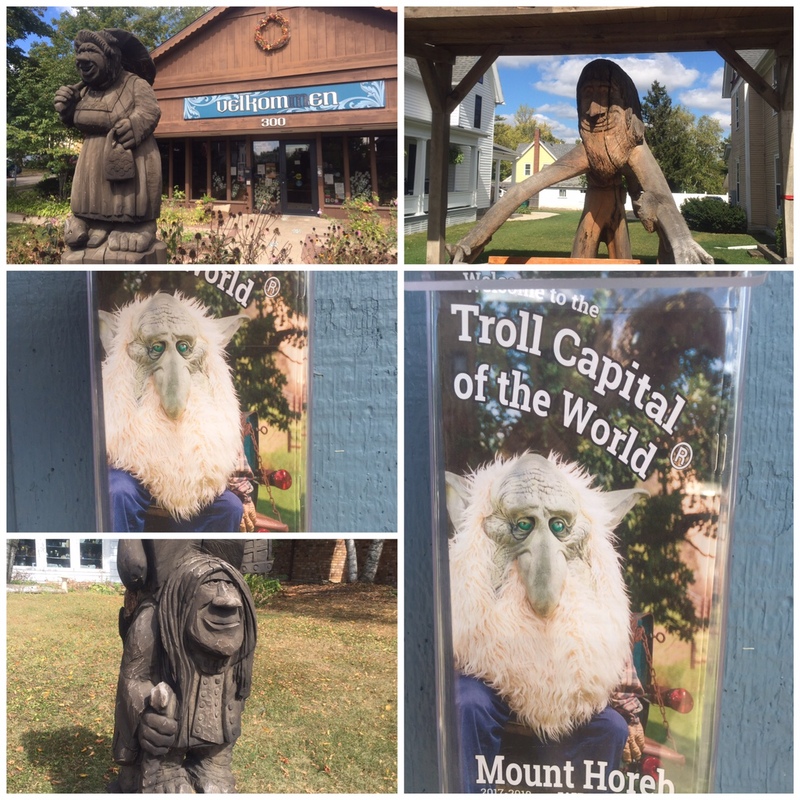 You can find the trolls in Wisconsin on the blue route. 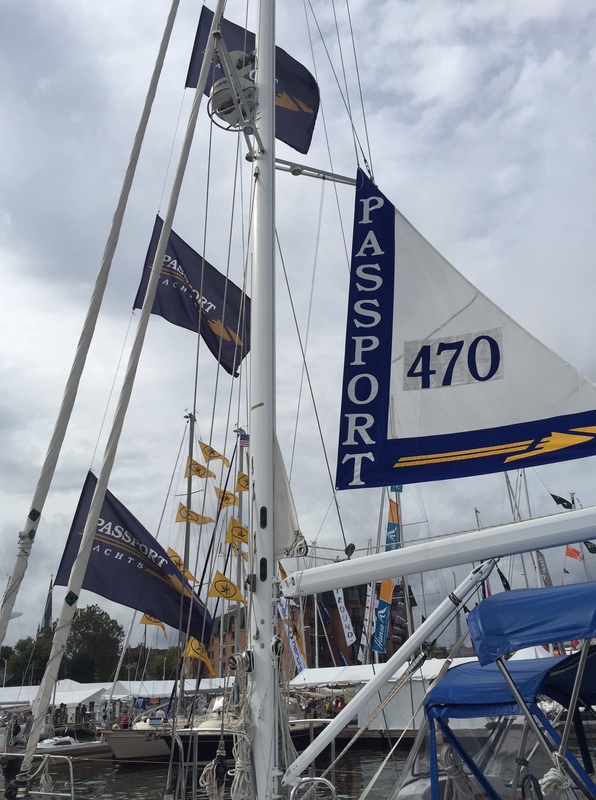 We spent the Columbus Day weekend working the Passport booth at the Annapolis Boat Show. In the process we became friends with the team that is helping us find a good home for Elizabeth Jean. A huge rainbow pointed our way to the Emerald City. 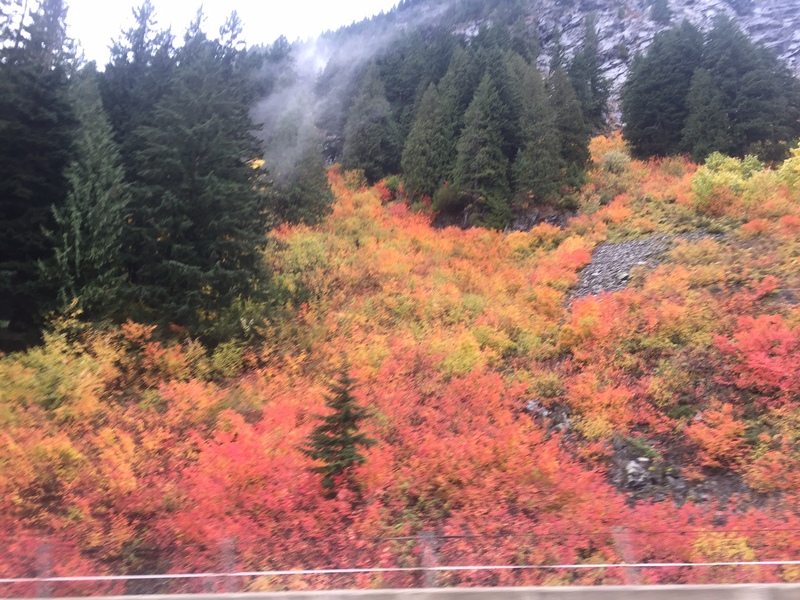 Fall colors glistened as seasonal rains welcomed us to the Cascade Mountains’ west side. 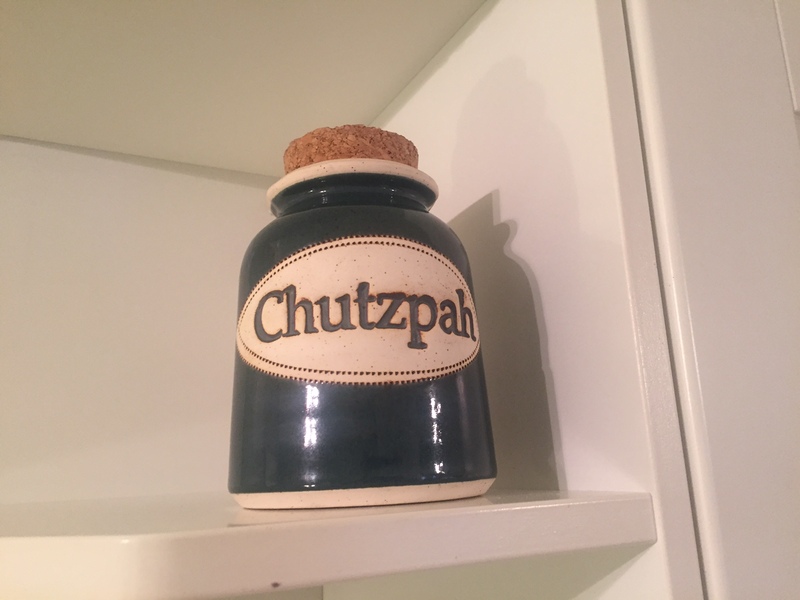 Our new friend Joan, office manager of the Passport dealership, awarded us the Chutzpah trophy. A number of our friends just called us crazy for our cross country travels. Almost four months have passed since we secured Elizabeth Jean to a dock in Hampton Virginia, just in time for a squall to wash clean her salt-rimed decks. These four months have at times had that “caught “in-between” feeling of which Jimmy Cliff sings. At the same time, 120 days (about a year’s third) have eased us from seafaring to a less salty, but equally rich life. In July, we joyously celebrated daughter Jean’s marriage to our new son-in-law Max. 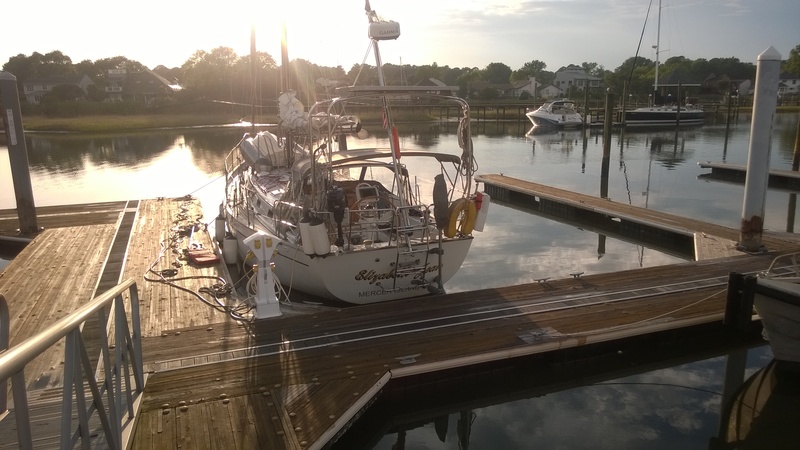 July began our new OPB (Other People’s Boats) voyaging mode as we helped our good friends on Bonni Jean II, a well-appointed 44 foot catamaran, transit from Annapolis to Long Island Sound. July ended with us back in Annapolis facing the heart-tugging and mind-numbing task of removing our belongings from Elizabeth Jean to prepare her for sale. On August 25 we spent our last night on our sweet ride and drove off all lump-throated in RAV, our new-used Toyota land yacht. We ended August gamely spinning at Soul Cycle in Brooklyn with daughter Beth. 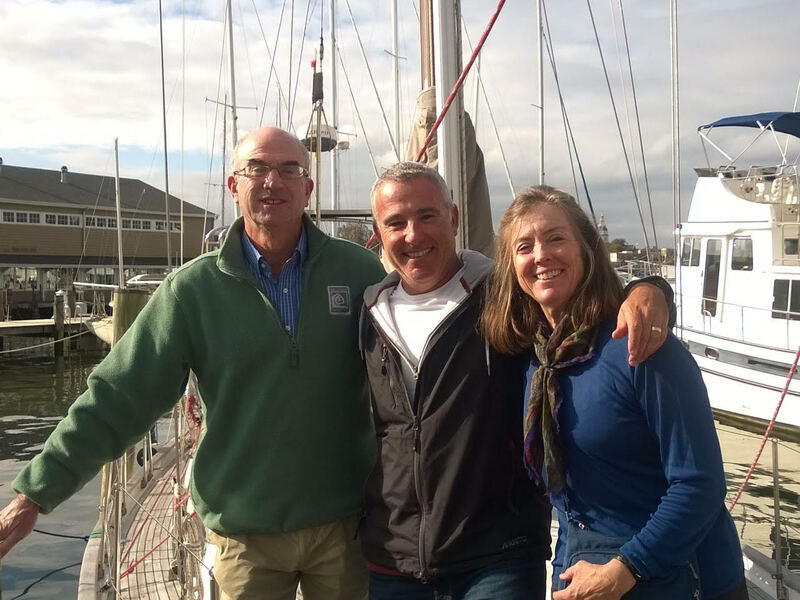 For our vessel decommissioning and meandering passage west to Seattle, we reactivated the friends and family bed-surfing plan that we perfected after our first cruising season. To all who recently welcomed Elizabeth Jean’s crew into your homes and helped us re-find our land legs, a hearty thank you. Mariners who are tired of the sea joke about walking inland with an oar until someone asks what it is. There they settle, safe from the sea’s charms. 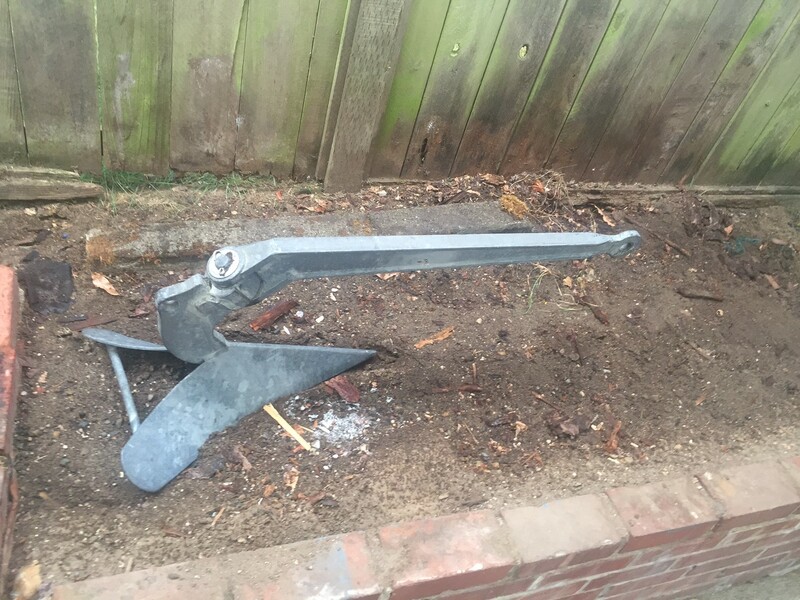 On September 24, we planted Elizabeth Jean’s original anchor (an oar would have been easier) in front of a snug little house just north of Ballard. Everyone in this Seattle fishing community and pleasure boating center knows precisely what it is. The sea is within whispering distance; she calls us still. The great capes are weather pivot points. As we rounded Cape Hatteras, cool moist air enveloped us. We added layers to the tee shirts and shorts that had been sufficient to the Cape’s south. The sun inched up over the horizon, joining the moon which had risen late and remained high in the sky. Cape Henry, the entrance to Chesapeake Bay lay less than 100 hundred miles away. At 6 knots we would enter the commerce-dense Bay in darkness. We preferred day light. As the south wind gusted to twenty knots, we reduced our jib to a napkin. 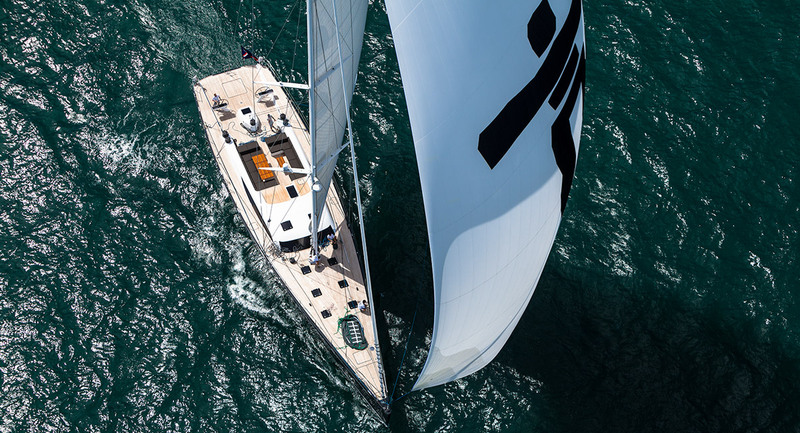 Elizabeth Jean mosied her way up the Outer Banks at a leisurely 2 knots. Slowing down helped us savor Elizabeth Jean‘s last day on the Atlantic Ocean. With daylight’s arrival the following morning we passed the Bay’s fishing fleet putting out to sea and joined the cargo ships and naval vessels entering the Bay. Around 1300 (1 pm), we tethered Elizabeth Jean to the fuel dock at Salt Pond Marina in Hampton Virginia. Four hours later, the squall hit. The torrential rains and arcing lightning, when viewed from our secure dock, reminded us of our decision six days earlier to leave the Bahamas rather than linger and shorten our weather window. 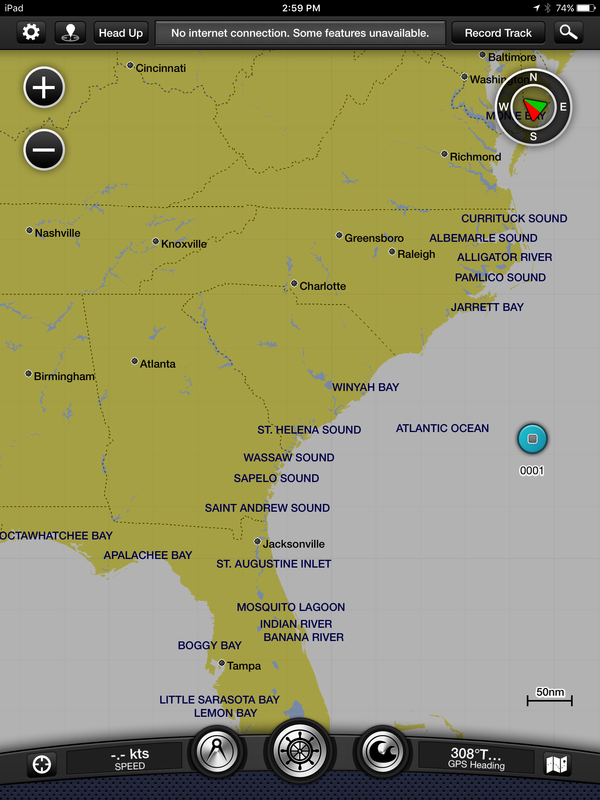 Had we stayed in the Bahamas we would have been weathering the storm rounding Hatteras. Rounding Hatteras brought cooler weather. 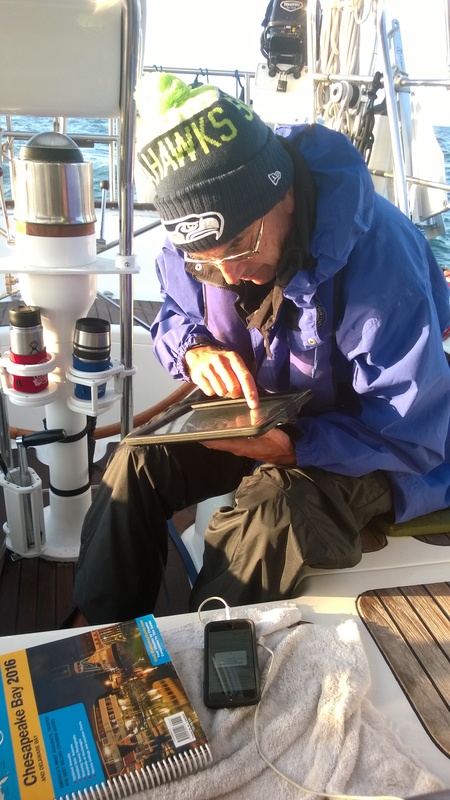 Eric reviews possible marinas on his iPad and in the Waterway Guide for Chesapeake Bay. Go Hawks! 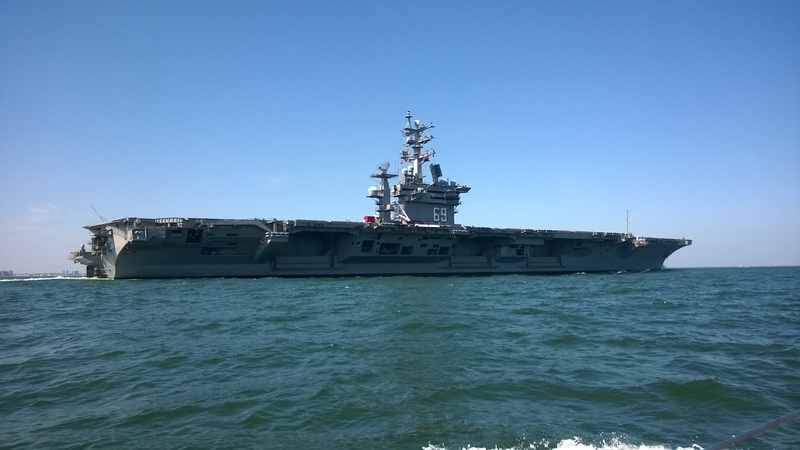 Ocean Jedi, Aircraft Carrier #69, steamed towards Norfolk as we made our way to Hampton. Elizabeth Jean, secure at Salt Pond Marina, over seven hundred miles from the Bahamas just hours before the squall hit.